While I’m chasing my field of interiors dreams, I work an office job by day during the week. I wake up early, feed the cats, apply my face, get dressed, make a lunch, but one thing that will always be part of my morning routine before I go to work is that I set aside 10 minutes to tidy our apartment. If you spend 10 minutes tidying your home in the morning, when you get home in the evening, exhausted from work, you will be walking into an already tidy home. More time for dinner, more time shooting the breeze with your spouse, more time chillaxing. The less chaotic your surroundings are, the more calm your mind is and the better quality your home life will be. My first real job when I was a teenager was working as a housekeeper in a Travelodge Hotel a stones throw from home. 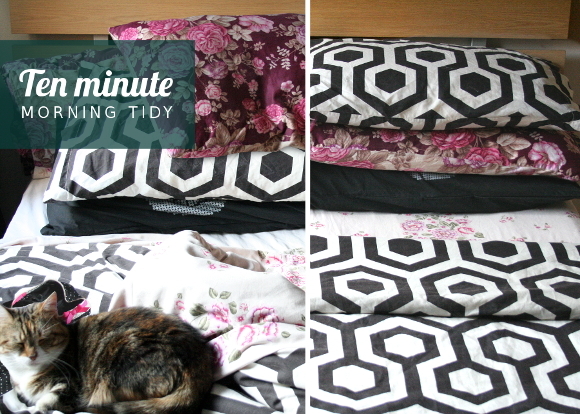 I learned not only how to change and make a bed in under 2 minutes, but the importance of a tidy bed. Your bed is the biggest thing in your room and the first thing you see when you walk into your bedroom. If it’s chaos, your room is chaos. It doesn’t have to be made perfectly, just a couple seconds of effort to straighten your bed sheets. Our living room is the heart of our home and therefore the quickest to fill with junk. It’s the messiest room so I’ll spend the most time tidying it. Still, I only allow myself 5 minutes, otherwise I’d never leave the house. I start off by putting the living room items back where they should go – tablet goes on our desk, the PS3 remote goes into the PS3 / husband accessories drawer, any notebooks go back onto our shelves etc. Anything that needs to go into the kitchen gets put on the counter and anything that needs to go elsewhere in our home I put in our chuck it bucket. Don’t waste time by running into every room of your house. We’re at a good place now as I’ve been avidly downsizing, organizing what we have and working on giving all our stuff its own place. A home for everything and everything has a home. If you need a bit of inspiration to get you started you can check out my 5 decluttering tips or my less 365 mission. There’s nothing I despise more than doing the dishes. We’re not blessed with having a dishwasher in our apartment so we have to clean our dishes old school style. And because of this, there are always dishes haunting our kitchen counters. 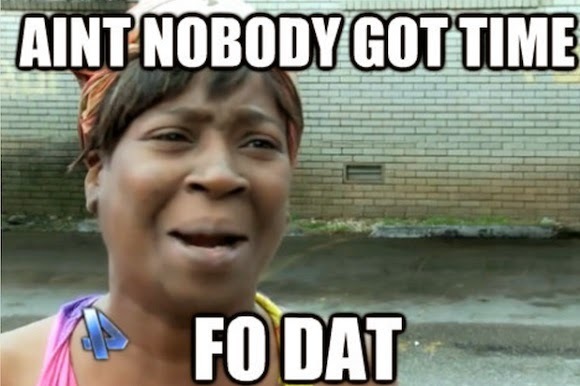 Let me get one thing straight, I do not clean dishes in the morning [that’s were I say ain’t nobody got time for dat]. I like to think of our kitchen as in a constant state of contained chaos. I stuff things in the recycling where necessary and stack all the dishes in the corner by the sink so they’re not all over the counter, where they patiently wait for my husband to come home and wash them. But for those of you who have the luxury of owning a dishwasher? Bend over and I’ll show you where you can put your dishes. You have no excuse. Next Post Blogiversary – Hydrangea Girl turns 4! Not sad at all!!! Look at who you're telling – there is no judgement here. I'm so glad to hear I'm not the only one that does this! I would tidy up in the evenings before bed, but it's a case that 9 times out of 10 the last thing I do before I go to bed is fall asleep on the couch. And it is not pretty. 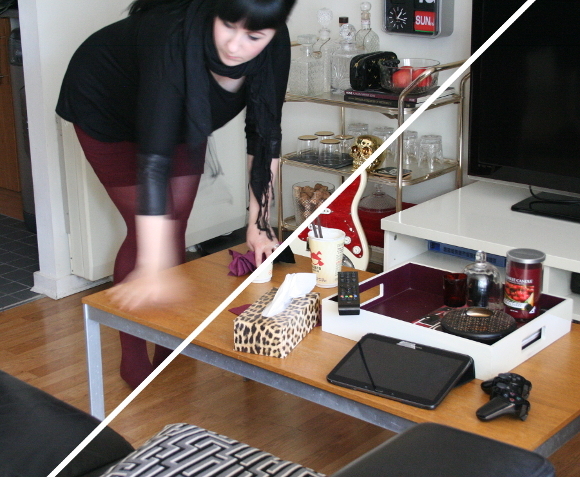 I'm like a zombie in that 10 minutes between the couch and the bed, so that's why I tidy in the mornings. Plus because I cycle home in the evenings, the last thing I want to do is tidy. The couch has my name on it. Young lady, you are so inspirational – I love this post. 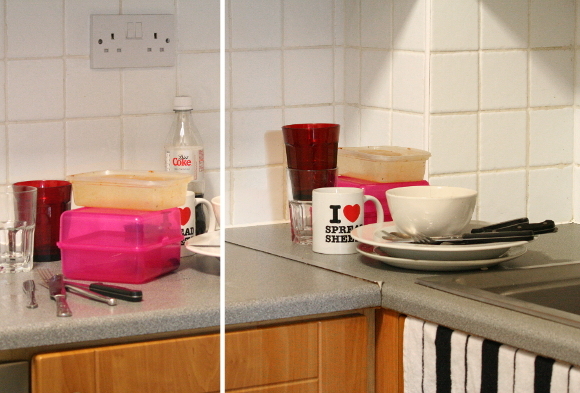 Especially the picture with you in it, it's so cool – hands a-blur as you get busy tidying! Things are a bit chaotic here – banisters being done, doors being changed, wood shavings everywhere… but when it's all sorted, I WILL make this home a tidy one! Just that 10 minutes each morning, to make everything feel that bit more calm and relaxing. And the downsizing and organising is the key – the less you've got, and the more ordered it is, that quick 10 minute whiz round will be all you need to keep on top of things. Everything just feels better when it's ordered – the Lumberjack really feels it too. He's all agitated at the moment because we've got things in random places where we've had to move stuff for the carpentry work that's being done, and the plastering starting next week (hall, stairs and landing and the spare room). I think he would love living with you – so tidy and organised!!! You will be my inspiration for getting things in tip-top shape! Hahaha, to get that picture I just waved my hands around a lot. I'm actually doing nothing. But don't tell anyone. Bahahahah!! Bend over and I will show you where to put your dishes. I love it. I think you have convinced me. I had recently adopted the 'always make your bed' rule, and you are right… coming into your room at night is a much better experience when the bed is made. I think I could be convinced to declutter our TV room every day, and put a few dishes away. 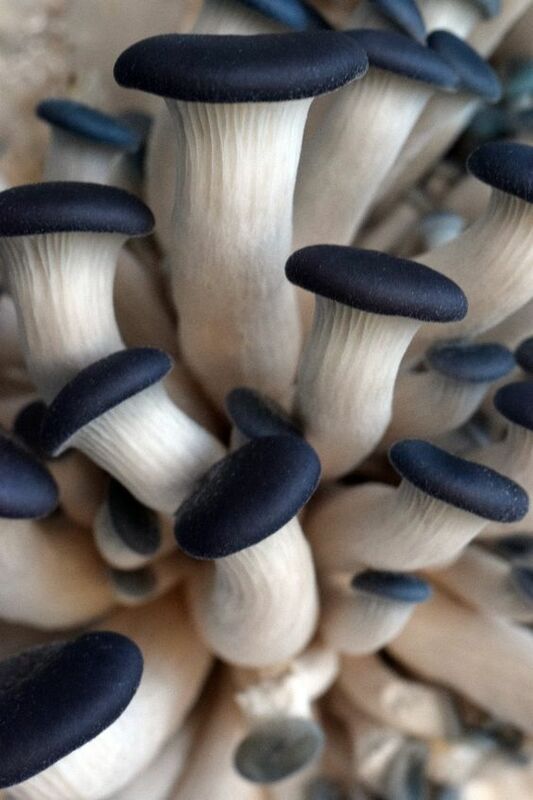 It is a small thing, with a big impact. It really is a time investment that I think a lot of people will benefit from. I know people will think I'm crazy at the idea but trust me, I've felt so much better now that I tidy in the mornings. Having said that, I don't have kids. That's a whole 'nother ball game. p.s. Well you've got to bend over to open your dishwasher! How else am I going to show people where they're supposed to put their dishes? Coincidentally I wrote a fairly similar blog post this morning! I found a great website called 'unfuck your habitat' and decided to take inspiration from their de-cluttering ways! Their website is unfuckyourhabitat.tumblr.com/. Great stuff! It's crazy because someone pointed this out to me on Instagram within 30 minutes of your comment. That site. Is great.